We got our fireplace insert working. Suddenly everyone wants to spend more time in the living room where it’s cozy and warm. NaNoWriMo has started. Everyone is taking a break from English, and writing fiction instead. Or researching settings, discussing characters, and adding to plots. Even if there is initial resistance, a project like NaNo is an exciting adventure. It’s not too late to join in now! We’re walking to the Kleenex box a lot these days…. Besides that, swimming lessons were cancelled due to problems at the pool and we tried to avoid grocery shopping. Only judo went on as normal. We learned about the famous Nova Scotia clipper Bluenose with the DVD The Queen and the Skipper. The history was fascinating and the sea and ship shots were beautiful…but then the commentators had to spoil it all by blaspheming. Not just once, either. Watching Miss 9 read real books. She’s eagerly working her way through the Moody series by Sarah Maxwell. 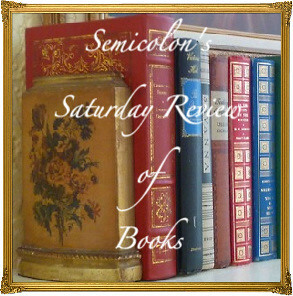 Even though I’ve read all four books aloud several times, my children love rereading them. Our newly instituted recess. What a wonderful way for us all to have some outdoor fun and for me to have a block of time to exercise every day. Not really a thought. Just a longing for sand, warm weather, and tents. For pine trees, brisk Canadian lakes, and long hikes. For nothing to do and long days to do it in. I suppose it’s partly that I want to escape from my messy desk, piled with my own work as well as all the miscellaneous stuff other people put on it. And I feel oppressed by my cluttered night table, and the piles of library books to return, and the mending pile, and all the dirty windows…and the harvest, still not quite finished. Usually I don’t feel quite this behind by the end of harvest time. Rather than dream of long relaxing days, though, I can continue cheerfully chipping away at all the fall cleaning until it’s finished and my own home feels peaceful to me again. Washing every blanket in the house, even the enormous one that doesn’t fit in the washing machine and needs to be hand washed in the bathtub. We have a spell of sunny weather, so I can hang them to dry outside. More than half the blankets have been washed and dried, and they smell so delightful! Finding inexpensive buckwheat. We just bought 50 pounds, but it smells slightly musty! I hate confrontations, but I’m ready to solve this problem this morning. Micah, Remembering You, A Jane Austen Education, Sense and Sensibility, Henry V, Wild Animals I Have Known, House of Hope, and The Reason for God. I finished Fyodor Dostoevsky by Leithart. The children and I finished Saint Patrick by McHugh (great story, written poorly) and immediately started O Canada: Historical Narratives and Biographies That Tell Her Story. So far, so good. The Little Misses and I still enjoying Little House in the Big Woods, and have just begun Rozemarijntje, the first volume of an old Dutch series. And of course, we’re still going through the huge Story Bible for Older Children. Sunshine! When there’s sunshine, we can walk outside cheerfully, hang out laundry, turn off the lights, and bask in the warmth. 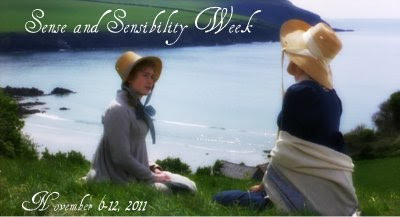 Once again, a blog button for Sense and Sensibility Week, which will be starting tomorrow.